Rafael Nadal: The greatest teen in men’s tennis history? Which male player hit the greatest heights in their teens? And how do the current generation compare? Game Insight Group investigates. After Stefanos Tsitsipas became the youngest player to beat four top-10 players in a single event at the Rogers Cup earlier this month, it feels like an appropriate time to ask who has been the ‘Teenage GOAT’ in men’s tennis? Using Elo ratings*, an alternative to more traditional rankings aimed at giving a greater insight into a player’s performance ability, Game Insight Group has tracked the peak performances by male players in their teenage years. Rafael Nadal takes the No. 1 ‘Teen GOAT’ position, with a peak all-surface Elo rating of 2500, which he earned with his defeat of Roger Federer in the 2006 French Open final. A player formerly coached by Becker, Novak Djokovic, lands the third spot. Djokovic reached a teenage best rating of 2387 in 2007, a year in which he reached three Masters finals and had 4 wins against top-10 players. Interestingly, the only other of the ‘Big Four’ to make the all-time top 10 is not Roger Federer but Andy Murray. This makes Federer something of a late bloomer compared to the other three most decorated active male players in the sport, although he certainly made up for a late start. Among young players in the current game, only Alexander Zverev has been able to crack the top 10 all-time best teenage performances, taking the seventh spot overall. His 2315 top teenage rating came when he won the Montpellier title last year. Four other ‘Next Gen’ players are included in the table above to give Zverev’s achievement more context. These four have trailed Zverev’s teen peak by 70 to 270 points. 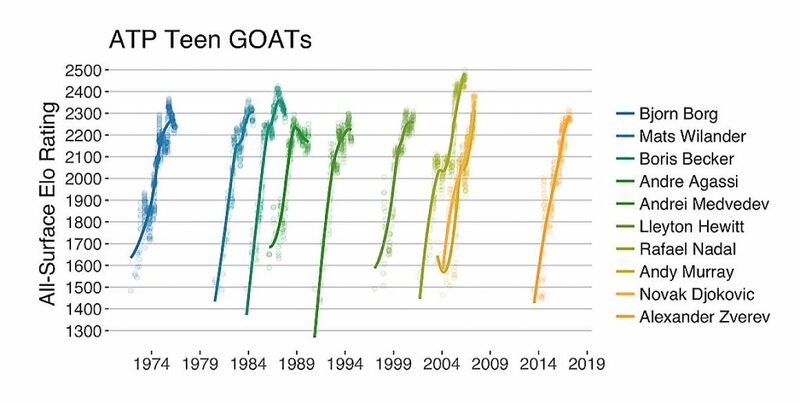 Looking at the actual paths of the top-10 ‘Teenage GOATs’ shows that they all have a skyrocketing trajectory in the early years of their professional career, with all of the players going from an initial rating of 1500 to over 2200 before age 21. It is also fascinating to see the gap in a teenage phenom between 1974 and 1979 and again between 2004 to 2014. So the mid-2000s does seem to have been an unusually tough period for young male players. We can pick out just a handful of players that have broken into the top 100 as teenagers and see that they are having similar accelerations in their ratings as the best teen players of the past. Three of the five shown here – Zverev, De Minaur and Shapovalov – have already achieved ratings close to or greater than 2200. Seeing how well they can extend these trends at the 2018 US Open will make for an especially thrilling two weeks in New York.